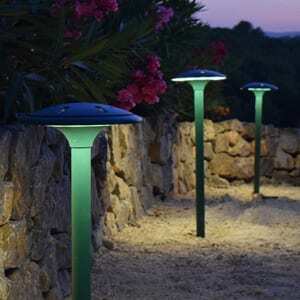 Many Garden Designers and Landscapers now source outdoor lights for their projects, and so have the responsibility to ensure fittings have the desired illuminated effect for the client. ‘Glare’ should be avoided wherever possible. This is a common, undesirable consequence of using lights that are simply too bright, not positioned correctly or do not direct light. Several factors reduce the problem of glare, which should be considered at product buying stage. Purchase fittings that accommodate a replaceable LED light source. This way, if illumination is too bright, try a bulb with a lesser lumen output. If the LED bulb ever fails, save a major re-install by simply changing the lamp rather than the whole fitting. Try removable accessories such as frosted glass lenses or honeycomb louvred filters. Frosted lenses with a spotlight, soften the beam effectively producing more of a ‘wash’ effect. Using a honeycomb filter will modify and diffuse a straight ‘spot’ beam. Use adjustable fittings for choice and direction. By installation stage, position of lights has been decided, but it’s best to use fittings that adjust to shine at various angles such as Spikelights for added versatility and to avoid glare. Choose well-built uplights with integral ‘covers’ or glare shields. These are particularly effective at focusing light towards one feature such as a statue. Larger professional path lights and bollards should have louvres or slats in the head to direct light downwards. Some also have frosted diffusers. Use Spreadlights – specialist low level pagoda shaped lights mounted on a pole. They provide a glare-free pool of light to illuminate a path, deck, terrace or low planting. The light source is under the ‘shade’ which distinguishes it from other Path lights and prevents light pollution. ‘Wash’ Walls in light with floodlights for an even coverage and to define a space softly or create a backdrop. Coloured floodlights can make for some beautiful effects in a walled garden or patio area. Lumena Lights stock a wide range of Anti-Glare lights and accessories. These include removable frosted lenses and professional Spreadlights such as the Charleston designs and the larger ‘Enterprise’. Many products are ‘Plug and Play’ such as the Litecast Wall Washer Kit, so incorporating anti glare lighting into your plans couldn’t be easier.